On Friday, Charlotte graduated from preschool. The school put on a sweet little ceremony, and Charlotte positively BEAMED in her cap and gown. Of course, with 3 more months of school before, well, school, I am in a comfy state of denial. Meanwhile, we're transitioning to summer: eating on the deck, going to the pool, wearing flip flops and sundresses. The fact that the temperature has been in the 90s, the past couple days of rain aside, lately makes it feel oh so very summery. The other night, a bunch of neighbors came over to our house for a casual barbeque. Lots of kids. And the kids ran and played on the slip 'n slide and sprinklers while the adults intervened only for potty trips and whatnot. Eventually, it became dark and the kids played and PLAYED. Doing what? I have no idea. They entertained themselves together. A slug was involved at one point. By 11:00, all kids were accounted for (Lorelei half crapped out in my lap) and uninjured, so their freedom didn't seem to hurt them. In fact, as the candles cast about happy shadows and kids ran around WAY past their bedtimes, it reminded me a lot of my summer nights as a kid: unbridled freedom, staying up late, playing made up games. The previous weekend, we had a similar summery evening. At the house of some peeps from our wee church, we hung out, ate and drank, and watched the kids have a freaking blast. Their neighbors, who happened to have two older elementary-aged girls, were there too, and they took Charlotte and Lorelei under their wings. They made up games, put on a magic show, created sprinkler obstacle courses, and jumped and jumped on the trampoline. Eventually, it got dark, and squeals and laughs and shouts of kids playing outside, past their bedtime, echoed. Happily. Lorelei is bouncing from book to book, pretty much as one would expect a toddler to do. Charlotte and I finished Dahl's The Magic Finger. 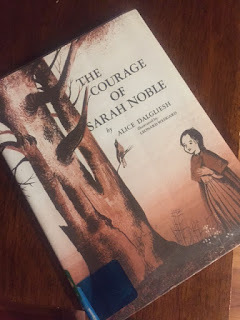 We've just started our next chapter book, The Courage of Sarah Noble by Alice Dalgliesh, which is wonderful so far. Written in 1954 and set in 1707 (based on a true story, apparently), Sarah travels with her dad through the wilderness to set up a homestead in Connecticut. Me, I still working on Vanessa and Her Sister, which is fantastic. I'm only 100 pages or so in, but I'm loving it. Within the week, I also cranked out If I Stay by Gayle Forman, a popular YA book. It left me a bit underwhelmed, though the premise is good: a teen girl in a car accident in critical condition must decide whether to live or die. I could sense the author or editor "crafting" the story---like, Increase The Stakes Here, and Show The Importance of the Relationship Here, and there was some overall cheesiness. Also, her parents were too cool, like the author was trying too hard. And yes, I'm still reading Jo Frost's Toddler Rules.